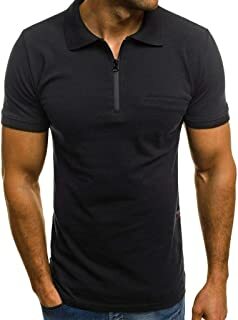 I first saw this black military dress shirt at an Express Men store, and I was immediately attracted by its elegant design. It's not just a regular dress shirt; it has grey lines running in the placket as well as on the back in a stylish manner. However I didn't get it then. When I got home I went on the Express website and saw so many positive reviews! 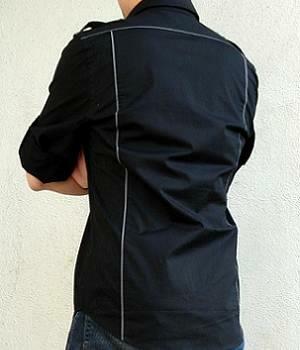 It looks far more interesting than just a regular dress shirt! Next time when I was at the store again I tried it on and it was WONDERFUL. I have to agree with the positive reviews on the website. It fits really well plus it looks great on me with its military inspired feel. 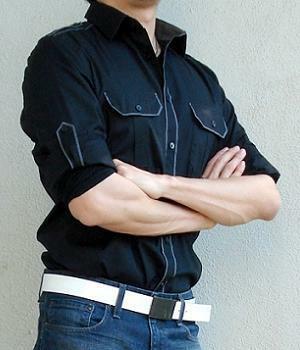 The true black color of this button down shirt matches well with the grey piping along the front placket, the chest pocket flaps, and the epaulette shoulder tabs. I cannot stress enough how much I dig the sharp color contrast. 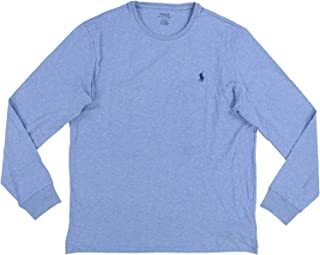 The shirt has long sleeves, but you can roll them up and secure them with the tabs inside and the shirt will look even better on you! Adding a bit of variety to your dress shirt collection is never a bad thing. Your day just might turn out differently for the better. I wore this paired with regular blue jeans to work and my co-workers complimented on it and asked me where I got the shirt. When your outfit gets mentioned by others in a positive way you know you are on the right track. 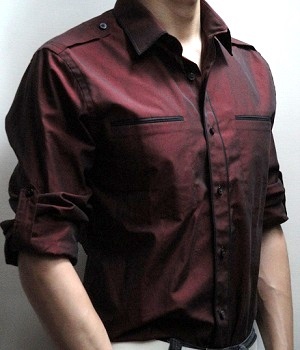 I was impressed by the combination of slim fit, crisp color contrast, and the material quality. 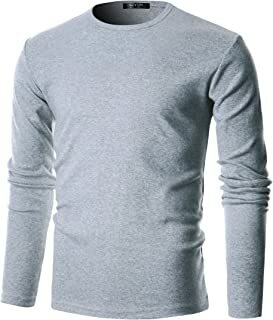 And to top it off, the added bonus of the military vibe with the clever roll-tab design on the sleeves altogether makes this shirt a great everyday uniform for both casual and formal events and perfect throughout the seasons.